Exquisite. I had to look it up just now to be sure I had exactly the right word. Yep. That’s it. Tonight’s classes were exquisite. Another of those “I don’t know how Sensei does that” evenings. I’ve been reading Dan Millman’s “The Way of the Peaceful Warrior” in which his training includes some intense self-discipline, and he manages that successfully (mostly). I found that admirable, enviable, and lacking in my own life. I have signed up for the week-long Living Embodiment Conference in November 2012, and I’m really excited about it, even though it’s not for months yet. Something about this work speaks to me, especially as experienced and expressed through Aikido. I keep telling myself I want to lose those last few pounds. And yet I find myself drawn to the kitchen, or mysteriously eating more than I really should. It’s not that hard, I’ve done it before… but it’s like I’m not paying attention. At all. Over the weekend I had things I wanted to get done. I did some of them, but piddled around and neglected many others. By Sunday night my car was still a mess, and I hadn’t started my laundry. Then today I couldn’t seem to get my brain wrapped around my work until around noon. Habitual, unconscious, self-defeating behaviors have been getting the better of me, and I’m not proud of it. I drove to the dojo after work fairly fed up and disgusted with myself over my lack of self-discipline. I considered talking to Sensei, but got busy warming up, and forgot all about it. The first class was a slow progression of exercises leading to a direct, penetrating kokyu-ho. Lots of feeling, receiving, and blending as uke, and giving clear, direct energy as Nage. 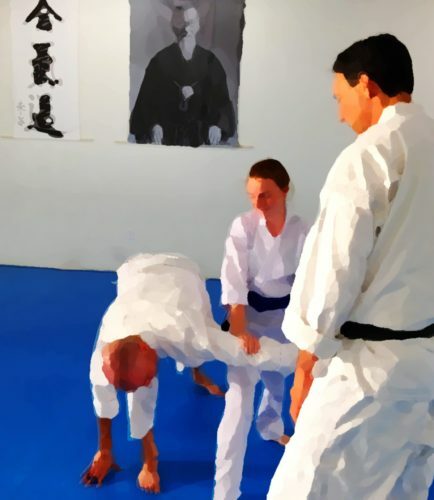 I had the privilege of training with some very new people, and watching how Sensei worked with them on where they were holding tension, being out of alignment, or resisting. I try to check my own ability to observe, to see if I’ve noticed any of the things he’s pointing out. It was fascinating, as that always is, and I’m grateful to be able to observe his teaching close up, in addition to experiencing it myself. So, I come to class all fired up to learn more about embodiment, and there it is, a major component of the first class. This happens a lot, and it’s not just me. It frequently happens that classes address something particularly relevant. People hear exactly what they needed to hear, or get to work through that thing that’s been on their mind. I hear of it happening very often. Maybe it’s one of those Shrimp Plate things, like when you buy a new car, and suddenly it seems like everyone is driving the same car. In any case, it’s magical when it happens. The second class, Sensei said, was going to be jiyuwaza (free technique). Awesome. Great fun, a good workout, and always revealing. True enough, but this one also dug a little deeper. It started with Sensei asking us to think of one way of being that, if we could be that way (or be more that way), our life would work better. (Not quoting here, just remembering it the way I understood it.) There is somewhere within me that little kid who wants to jump up, arm waving, and shout “Oooohh!!! Oooohh!!! I’ve got one!! !” Yeah, no long soul-searching required here: “My life would work better if I were more disciplined. Or maybe focused or something.” I tried escaping from it momentarily. “No, disciplined.” Done. And again I had that experience of wondering if Sensei has installed a chip in my brain that gets scanned as I enter the dojo, or if he just reads minds naturally. In any case, I was delighted that the class was heading in this direction, because I needed it! I decided that whole and committed alone were dull and lifeless. So maybe another quality that would support me in being disciplined would be passion. It’s hard to be disciplined about anything if you’re not passionate about it. So I played with passion next – whole, committed, and passionate. Much better. More life, more power, more outward, more exciting. But still deadly serious, earnest, forceful… Still not a nice place to be. Effective, but somehow lonely and cold. Still dark and heavy. Dark and heavy, eh? Hmmm… What fourth quality would support me in being a more disciplined person? Lightness? Could self-discipline be light? Bright, airy, and weightless? So I chose that, as a counterbalance, or complement. In jiyuwaza it worked beautifully – whole, committed, passionate, and light – and was a lot more fun. Wait, you mean one can be disciplined and joyful? Interesting… What sort of underlying, unnoticed, and unquestioned assumption about life would I need to have where learning that would be surprising? Oh, right! That being self-disciplined is to be serious, all work and no play. No fun allowed until you’ve done the things you’re supposed to do. Whoa… I checked in with what I was feeling. Yes, thinking about being a disciplined person feels, in my gut, like being sent to my room, or like being told I can’t play with my friends until I do my homework. Of course I want to get away, and be anywhere else! Of course I rebel at the perceived confinement, restriction, and separateness. What if my assumption about life and being disciplined was wrong? (Duh…) What if I can be a disciplined person who is whole, committed, passionate, and light? That brings up a whole different feeling – a sense of energy, potential, wonder, enthusiasm, togetherness, and freedom. Maybe it’s not only possible to lighten up and still be successful, maybe it’s necessary, for me. Hmmm… Well there’s something to play with (and remind myself of) tomorrow morning. And the next day, and the next. I bowed in expecting to have a good time throwing my friends around the dojo, and getting thrown around in return. Yes, that was there. But also layer upon layer upon layer of discovery and learning? Dan Millman learns, in the book, that there are no ordinary moments. Indeed, there are no ordinary Monday night classes. I think “exquisite” pretty much nails it.